Chief Briggs (CIA) says, "Wow, what a great idea for a site! Hats off to the builder of this one. Thor is a '96 Royal custom with paint by ? myself of course. 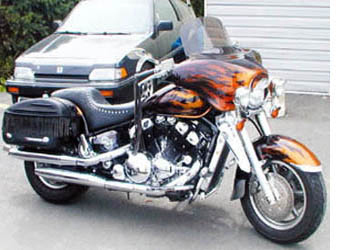 Harley batwing & bags and Venture exhaust, big beach bars, and lots of mods coming. Have camper (not shown). 55k miles only, reason for mileage being so low is we parked her for a year and we have a short riding season, eh!" (Canadian cousin, perhaps?) Web site is given as crystalimageartwurks.com.